Georgia is among the countries which are called developing democracies. In Georgia’s case, this means that despite many reforms that were implemented and success stories achieved through the process of reforms, numerous problems remain which need to be addressed and solved. Problems faced by persons with disabilities in Georgia is among the most acute of these issues. Their engagement in everyday social and public life is very low. This is caused by obstacles created by the family as well as from the state. In Georgia, persons with disabilities are generally considered to be hidden from the rest of society. In many cases, families think that this is the way it is supposed to be. One of the biggest problems is a lack of awareness about disabilities, as people think that certain kinds of disabilities might be contagious. In the best case, society treats persons with disabilities with pity. People with disabilities are not considered as ordinary members of society and this is partially caused by the attitude that was created during Georgia’s Soviet past and it still continues today. The problems that persons with disabilities face are considered primarily through a medical perspective, rather than social. That is why, rather than adapting the environment to everyone’s needs, the state focuses its attention on trying to improve the capabilities of persons with disabilities. Several youth-led NGOs are nowadays involved in improving the environment for persons with disabilities and they are active with support from other NGOs and international organizations. Together, they are implementing various advocacy campaigns, informative meetings, and rallies. These activities led to the ratification of the United Nations Convention on the Rights of Persons with Disabilities (CRPD) by Georgia in December, 2013. Ratification of the CRPD created many opportunities for youth-led organizations that focus on problems faced by people with disabilities, including ”Changes for Equal Rights”, which is the first organization based in my region of Adjara which has a person with disability as a chairperson. Adjara is an autonomous republic within Georgia and it recently created a coordination council where NGOs working on disability problems and representatives from the government will discuss ways of solving the problems. In 2013, “Changes for Equal Rights” was actively engaged in numerous advocacy campaigns focused on the right of voting for people with disabilities; the campaigns were conducted with the help of young volunteers; through informative meetings and rallies, they urged and encouraged persons with disabilities to participate in the elections. With the support of an umbrella coalition of disabled persons’ organizations in Georgia, the Coalition for Independent Living (CIL), we managed to provide transportation from individuals’ homes to the precincts for those persons with disabilities that expressed their wish to take part in the elections. This way, we were able to demonstrate to the politicians the need of adapting election districts as they are losing the support of potential voters. After these activities, the government took responsibility to create a more-accessible environment by the 2016 elections. 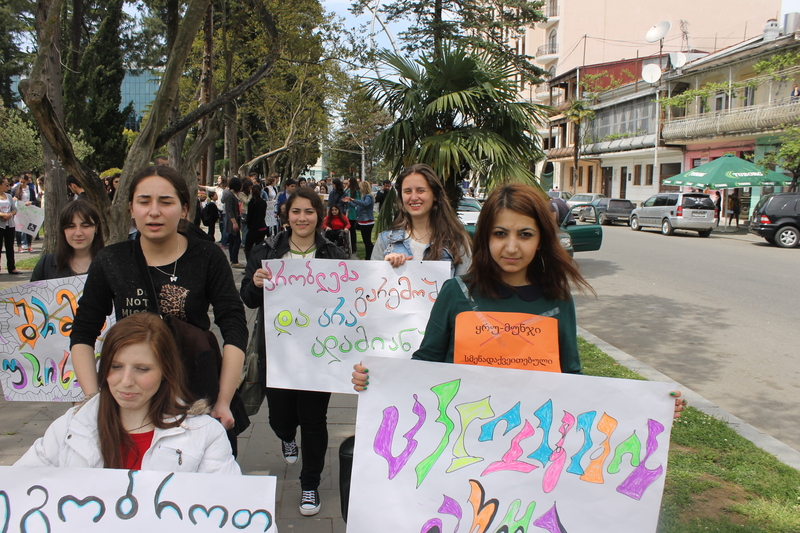 In 2014, the organization “Changes for Equal Rights”, in cooperation with other youth NGOs, conducted educational trainings in public schools throughout Batumi, Adjara’s main coastal city, informing school pupils about attitudes and terms used toward people with disabilities. Through this project, the students created volunteer clubs focused on accessibility and inclusion activities with the support of 50 student volunteers. One such project, titled “Open the Ramp” was aimed at bus drivers who had an accessible vehicle but did not open the ramp for persons with disabilities trying to access the bus. In response, the youth group organized a press conference with the involvement of the Public Defender of Georgia, in addition to different rallies, to shine a light on this issue. As a result, the public transport authorities requested trainings for its drivers on accessibility and inclusion issues. During the recent election of Batumi’s mayor, our youth group organized public meetings with candidates so that persons with disabilities also had the chance to talk to the candidates and be informed this constituency’s views on different topics. These meeting were conducted multiple times and as a result, the Mayor of Batumi now has a counselor focused on issues of accessibility for and inclusion of persons with disabilities. The counselor was an active participant of the youth group’s activities. Currently, we are conducting meetings at universities and public spaces, and taking part in TV programs to increase awareness about the needs of persons with disabilities. The future goal is to start a television show which will address the problems faced by persons with disabilities; the anchor will help destroy certain stereotypes because he/she will be a persons with a disability. Batumi is considered one of the most adapted cities in Georgia, which is partly due to our various efforts directed toward the government and the public. Civil society in Batumi is also providing private enterprises with suggestions on how spaces like restaurants or other business can become more accessible. Our group, in cooperation with the Adjara Health Ministry, plans to start an internship program for persons with disabilities leading to more experience and employment. Moreover, we plan to start activities in the mountainous areas of Adjara, conducting seminars and training locals with the help of volunteers to create the same kind of volunteer network in mountainous villages. Our youth group actively uses social media to plan and implement activities, as well as to keep society informed. Ramini Matcharashvili is a disability rights activist and founder of a youth-focused non-governmental organization in Georgia called "Change for Equal Rights", which operates in the city of Batumi and works to support the rights of persons with disabilities.